Continuing on the topic of tie weaves, let’s look at some more recent ties in the series. 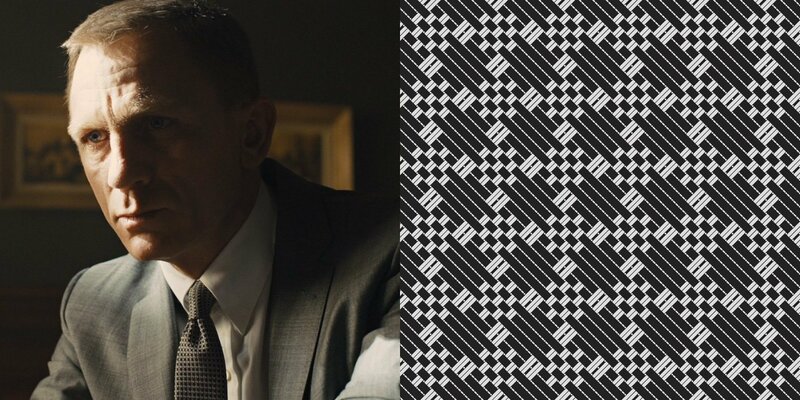 The Tom Ford ties in Skyfall, like the ones that came before in Quantum of Solace, are some of the nicest of the series. Craig has never been dressed in a tie of questionable taste, which places him alongside George Lazenby and Timothy Dalton. Though Dalton’s ties are very forgettable, he never wore anything that could compete with Sean Connery’s wide pink tie in Diamonds Are Forever or Roger Moore’s colourful striped tie in Moonraker. Two of the Tom Ford ties in Skyfall hint back to the classic grenadine ties Sean Connery wears in his Bond films. Though these ties are not solids like Connery’s grenadines, the weave somewhat mimics a grenadine weave, with tightly woven sections between floated yarns. There are no twisted yarns. The tie is woven with a different colour in the warp than in the weft, and it creates an intricate and elegant pattern. The first one (top) is silver on black, worn with the pick-and-pick suit at the beginning of the film. The second tie is charcoal on light blue-grey (above), worn with the charcoal rope stripe suit. Though the colours are different, reversing the dark and light in the warp and weft gives each tie its own look. Like how Sean Connery wears only grenadine and knitted ties in his Bond films, Daniel Craig only wears neat-pattern ties in his. Craig’s typical ties have the same subtlety of Connery’s ties but with more interest in the pattern than in the weave. These ties have both interest in the pattern and texture, with a good balance of each. Completely agree, although it is, of course, a matter of personal taste. For many years now my preference has been for what you call “neat-pattern” ties, especially the alternating diamonds pattern that I generally call basket-weave. I find that this pattern in particular gives a wonderful depth to a tie, even more so if it’s made of three different colours. I even have one with four (black, dark grey, light grey, and silver)! The thing that surprises me is how difficult it is to find ties in subtle patterns like that, or the SF woven ties up above. And the few times that I do find ties in the “basket-weave” pattern the colours are usually high-contrast which makes the ties a little headache inducing! By that I mean black and light silver instead of black and dark grey, or navy and pale blue instead of navy and darker blue. I’ve been considering getting some custom woven ties made because of this. Unless anyone here has any suggestions of where to find similar ties..? Well said, and I agree. Craig’s ties always seem to be nice, and contrast is not the order of the day. But the subtle patterns provide a contrast and class of their own. Perhaps Sam Hober ? You can always check his patterns on his website. To be honest I find these ties elegant but a little boring. The main problem with the way Craig wears them, however, is that they provide no contrast with the suits: grey suit-grey tie, blue suit-blue tie. How about a burgundy tie for a change? I quite agree with you Dan. To me, it looks like Craig -or the costume designer maybe- choosed to be between Connery’s classic and continuous -some could say repetitive too- soberness, with grenadines ties, and Moore’s and Brosnan more colorful and patterned ties. 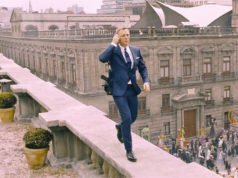 At least in Casino Royale and QOS there was some diversity : he wore a nice burgundy tie in CR and a nice champagne tie in Bolivia in QOS. I wish some other tie colors would return too, such as brown, marron, burgundy. But it’s quite normal for Bond to stay with safe colors such as grey and blue too. I am not mad of the Skyfall ties, they gave me the impression the tie has been made to look like a grenadine one, but it isn’t. I think that the thing to remember is that the width of ties is not the only thing to go in and out of style; colours and patterns do as well. About two years ago I noticed the emerging trend of matching one’s ties closely to the suit so it certainly isn’t a “Skyfall thing”. It’s funny, I was just remembering this weekend that in the mid- to late-90s the in thing was to match your tie as closely as possible to your shirt (and very colourful shirts at that) – light blue tie with a light blue shirt, mid-green tie with a mid-green shirt. I remember thinking how original and cool it looked until an older friend pointed out that that was a big thing in the mid- to late-60s as well (apparently Johnny Carson often dressed in that style). Matching the tie to the suit can be seen on Bond in the 60s, 80s and now. It’s not an easy thing to do. The matching tie and shirt trend was most memorable for the Americans on Regis Philbin on Who Wants to Be a Millionaire. Even at the time people were making fun of that look. Thankfully Bond never did that, except for one still I’ve seen from Tomorrow Never Dies. Good God–I had forgotten about that aberration until just now. The matching shirt and tie has to be one of the worst fashion trends of all time. There are indeed much worse things, but nevertheless it’s not a good look. I’ll have something up about Brosnan’s matching black outfit by the morning. Are you talking about the charcoal suit from Tomorrow Never Dies, Matt ? I can’t remember what the suit in the still was. The outfit overall was not used in the film. I just looked it up. The suit, shirt and tie appear to all be solid black. It looks more like something a Bond villain would wear. Christian, I can’t agree with you more !! Both very nice ties. Do we know who made them? Tom Ford made them. I edited the article to make it clearer. What is the difference between burgundy and maroon? I assume burgundy is considered the darker shade. To be honest, I don’t find the striped “Moonraker” tie that offensive (for me it’s so-so) and not anywhere as bad as Connery’s DAF tie, which has to win the award for worst Bond Movie tie hands down. As regards Craig’s ties here I can’t see any problem with them and I agree that the idea seems to be to provide some twist on the traditional grenadine which would be nice to see return in its own right (but then there’s a lot of garments that it would be welcome to see return). Personally, I would say that a traditional Bond semi spread collar would make them stand out more and I can’t really understand the decision to use these finicky tab collars. They don’t seem like something Bond would choose for his wardrobe even if the ties do. Finally, Christian, I can’t really say I care for the “greatest suit in movie history” in either its cut or its color, to be honest although I would accept that Cary Grant played the well dressed, gentleman lead very well over all! It isn’t just the suit (whose fit, I am not a big fan of though it does seem to bridge the 1950s and 1960s rather perfectly), but that Cary Grant’s Roger Thornhill is in the same suit for three days, from ordering a drink at the plaza, struggling against Vandamm’s henchmen, drunkenly driving the Mercedes in his escape, dodging police and a biplane, and ending up at an auction in Chicago and shot at Mt. Rushmore. Like Bogart’s white dinner jacket in Casablanca, it is impossible to disassociate the action and actor on screen from the single costume that exemplifies the character (Madison Avenue’s “Mad Man” or shady Casablanca nightclub owner) and the character’s travails. This makes it, in my view, the greatest suit in movie history, with a strong challenge from Bogey’s white tux. Fair points Christian and I can appreciate the contextual argument. James Bond is a well dressed man,but is not a dandy. His style is sober. Is clean,minimalist, and is the James Bond’s style. 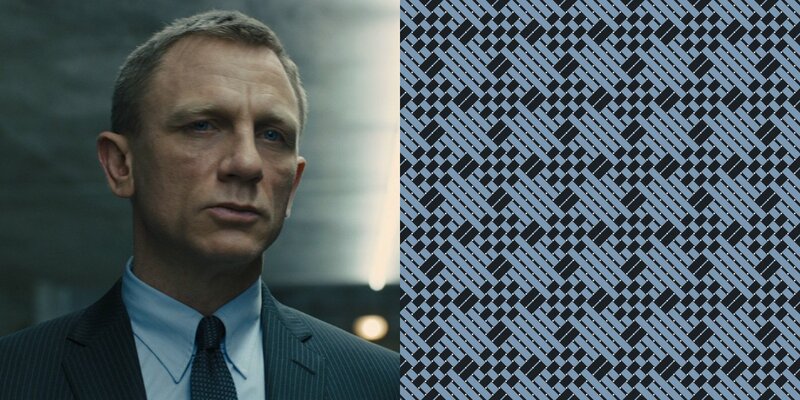 I don’t think that a colourful pattern on pattern style is good for Bond. The Roger Moore style was his own style,not the style of character. Dalton regard clothes was more “Brioni,James Brioni” that Bond. Costume department of Craig’s movies dress Craig like Bond should dress,but fall in fit and length that is too much trendy. Honestly, I really like those ties. They have texture that gives them more appeal than solid ties. But they are also simple and elegant. Personally, I think the colors of the suits in Skyfall is great. Grey and blue suits, pale blue and white shirts, Grey and blue ties. I just find them very elegant. Where can I find these ties online? I’d like to buy one. Try eBay. They come up occasionally in other colours. Though I didn’t like the fit, the colour and pattern choices on everything — suits, shirts, ties — were pretty good. They hearkened back to Sean Connery, but one still wonders why that didn’t extend to the style, especially for a 50th anniversary movie. Had they opted for spread collars and two button suits with double vents instead, the homage would have been far better. Hi Matt, reales like your Blog. Do you Know the correct widht of the skyfall ties? Are they 3.00 or 2.75 inch? Thanks! The ties are 3 inches wide. 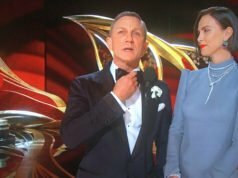 Why does Bond wear so few red ties? I think Roger Moore wore some, and Brosnan did wear one in The World is Not Enough and Die Another Day with Navy and Grey suits, but that’s about it. Connery and Craig did not wear any that I can remember of. Bond’s ties are either in shades of blue and gray and brown, and occasionally black, but no other variation. Red ties have been mostly considered business appropriate, but why does Bond wear so few of them. They would look very good with navy and charcoal suits, both of which he wears a lot. Bond is usually dressed not to stand out, and red ties stand out. Love the dark blue tie here’s pattern from Skyfall but can’t find it anywhere. Does anyone have a more precise manufacturer’s description, manufacturer model number or name, or place to buy? If it is not available anymore is there somewhere i can get something similar? I guess it’s made by Tom Ford? The tie is indeed from Tom Ford. The closest tie I have found is this from Thomas Pink: http://www.us.thomaspink.com/Warren-Check-Woven-Tie/Ties/thomas-pink/fcp-product/99931707. The pattern is the same, but the colours are a little different. Thank you for the response. Its a shame that the Tom Ford tie went out of production. But i will definitely take a closer look at the tie from Thomas Pink. Again, thank you.